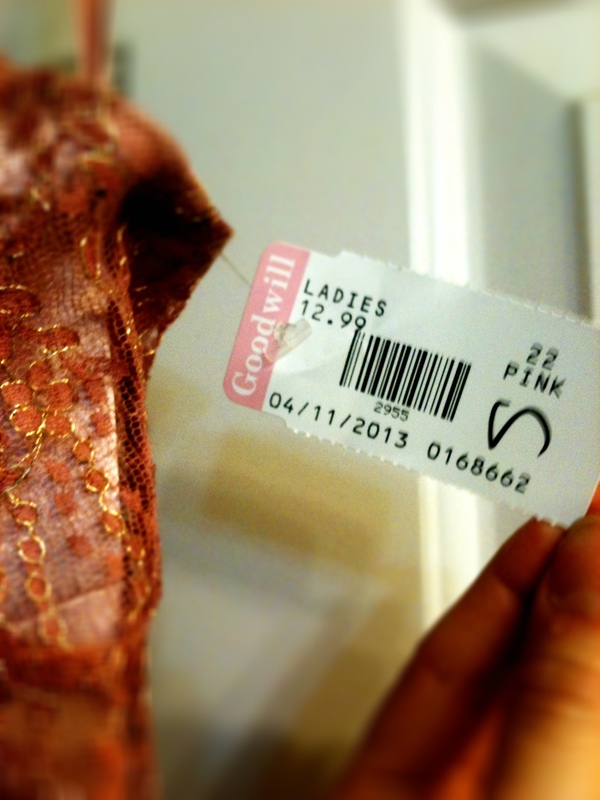 Goodwill shopping reminds me of a lottery scratch-it. Most often I expend a lot of time or energy scratching the surface and either come up empty handed or find something basic that barely justifies the time commitment. Other times, beautifully rare times, I am rewarded with a fantastic prize. For better or for worse, I work about 3 blocks from a small Goodwill store. This particular Goodwill is in a [for lack of a better vocabulary] richer neighborhood. There are a lot of young professionals working and living in high rent condos. The clothes on display are chosen to appeal to that demographic. On this particular rainy Friday, I ducked into the Goodwill on my way to meet Greg for dinner downtown. I was not looking for anything in particular. Though if I saw something I loved, I was willing to leave with a “red carpet dress” that could be used for a Film Awards Gala event at work next month. 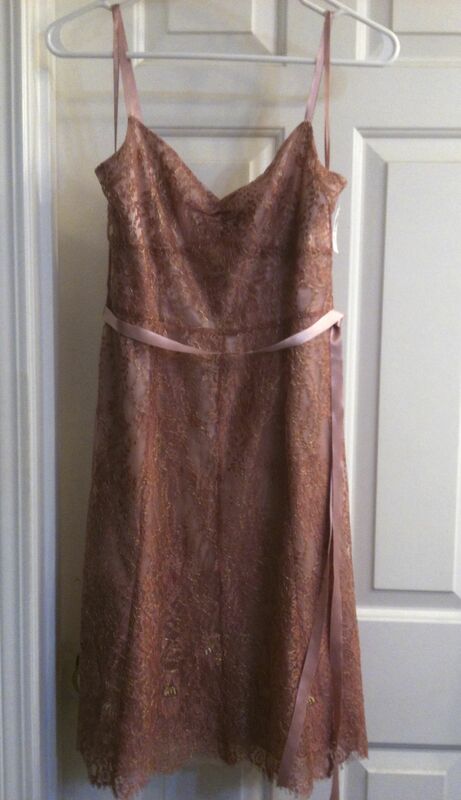 A swatch of rosy lace with highlights of gold beckoned to me, and I found this dress. It was a color I knew I look good in (my college graduation dress is a similar color). It was also a mixture of flashy and subdued. I like clothes that can transition between night-out and work. At $12.99, as long as it fit, the dress would be a good investment. 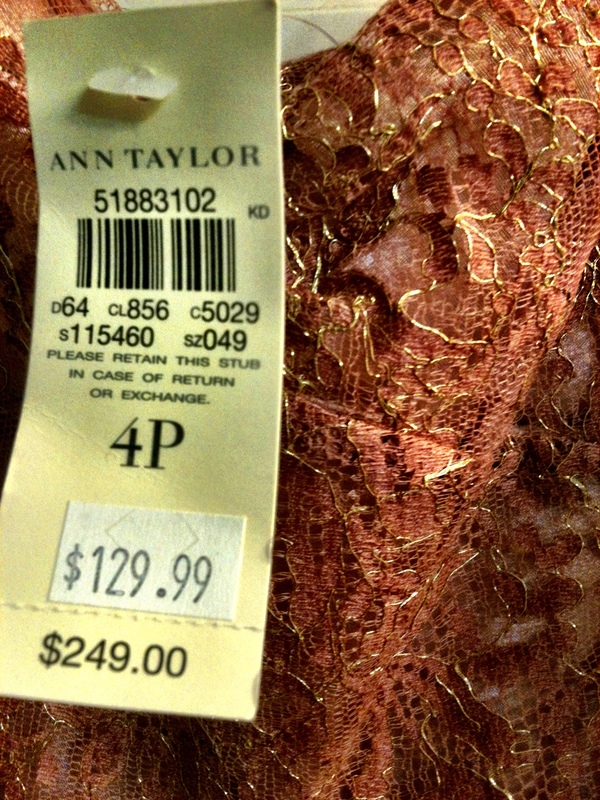 Then I caught sight of the original price tag. [GASP!] You do the math. At that moment, I decided that I would buy it even if it did not fit perfectly. Refashions can be done. When I got home and showed my treasure to Greg, he thought the dress had a vaguely bridesmaid-y aura to it. The possible life-history of the dress abruptly shifted in my mind. The primary reasons bridesmaid dresses go unworn is the postponement or cancelation of a wedding. My feelings toward the dress are now bittersweet. I remember how excited I felt when my friends asked me to be a bridesmaid in their weddings. Even if dresses are material things, I form deep emotional connections between those dresses and the friends I love so dear. I hope that I can find enough meaningful uses for this dress to overwrite its [possible] history. Is anyone else suffering from stash envy? I love a good thrift store find! This one looks like a pretty exceptionally great one. 🙂 Nicely done! Wow, what a great find! Although it is sad if it was at the Goodwill due to a postponed/cancelled wedding. But you can give it a better life! This actually reminds me a lot of an Inara fabric! Either way, I’m glad you could save it and give it a good home.